BOA Compression Back Brace – Pacific Medical, Inc. The multi-functional BOA (Back Orthotic Appliance) compression brace. A maximum support LSO for pain, rehabilitation and maintenance. Adjust compression with single tension handle. 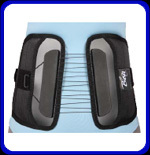 Ideal for acute and chronic low back pain and post-op support. Rigid anterior panel included for limitation of forward flexion. Ability to integrate lightweight rigid chairback frame. Allows for optimal posterior support, especially in post-op situations. Heat-moldable frame is lined with foam. Lordotic inserts may be used for added comfort.